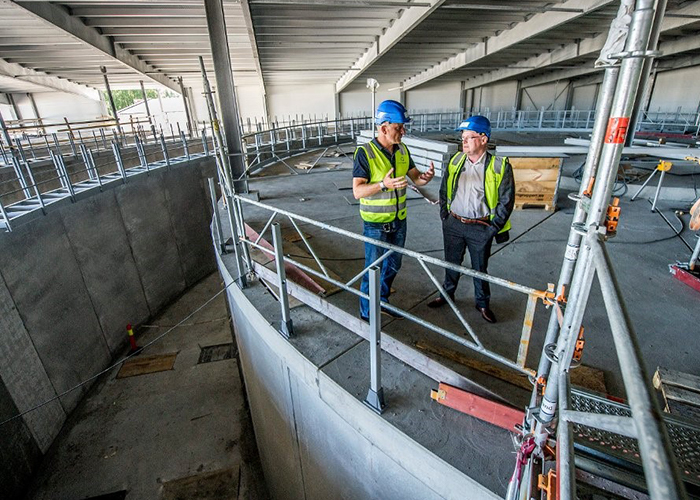 A preview of our cutting edge on-land salmon farming facility. We are excited to share a new 3D animated video of our Belfast project. The video shows how both phases of our state-of-the-art land-based facility, will fit into the landscape. Some highlights are the preservation and protection of recreational trails, green buffers, the reservoir and dam, and the brick building, which will become a visitor and education center. The video also shows the rooftop solar arrays that will provide a portion of our power needs and takes you inside the facility to see how our patented design innovations are bringing land-based salmon farming and sustainability to a new level. We hope you will share the video with others who want to know more about our Belfast facility and how it is leading the way for 21st century aquaculture in Maine and the U.S.
As we’ve noted before, one of the main reasons for building a facility such as the one we’re planning for Belfast, is the vast amount of fish that the U.S. imports each year. As Maine-based Associated Press writer Patrick Whittle notes in the recent story below, fish imports reached a new record in 2017. Raising more fish in the U.S. is the only way to offset both this major trade imbalance and the environmental impact of airfreighting fresh fish. Nordic Aquafarms is currently signing on new engineering resources in Maine to move the project into and through the permitting process. Most permit applications will be submitted in late summer when preliminary local engineering has been completed. Additional environmental studies will also be completed by Maine partners during this period. Clarifying the project details takes time and resources. We will provide more detailed information about the project through the permitting applications. We’re pleased to announce that David Noyes of Kenduskeag will join Nordic Aquafarms in October as Chief Technology Officer (CTO). Noyes grew up on a small cattle farm in Canaan in a cabin he built with his father and brother from logs off the farm. David earned a Bachelor’s degree in Marine Biology from the University of Maine in 2014, then worked at the Jackson Laboratory in Bar Harbor. He was later operations manager for Acadia Harvest in Franklin, where he oversaw multiple recirculating aquaculture systems (RAS) for raising Yellowtail kingfish and several other species. Since 2017, David has worked as a laboratory assistant at the National Cold Water Aquaculture Center, USDA Agricultural Research Services, also in Franklin. In addition, David is a 15-year veteran of the U.S. Army National Guard and currently holds the rank of Sergeant First Class. He deployed to Iraq with the 133 Engineer Battalion for Operation Iraqi Freedom 2 and spent eight years working in Belfast with the 262nd Engineer Company. We expect to make more announcements of U.S. executive recruitments later in the fall. We hosted a public discussion on aquaculture and Maine seafood. 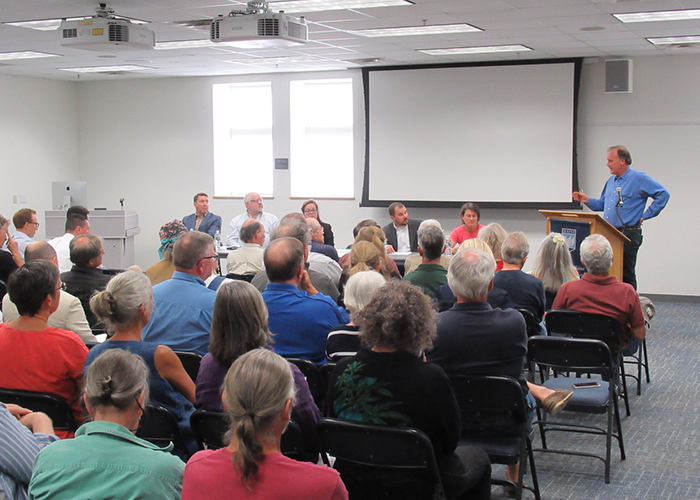 As part of our ongoing commitment to provide the public with information about our Belfast project and how it fits into the larger picture of aquaculture and sustainable fisheries in Maine, we were pleased to host a panel discussion on June 12 at the University of Maine Hutchinson Center. We also say a hearty “thanks” to everyone who took the time to attend this informative and wide-ranging discussion. Our team will finally go local this summer. We’re pleased to announce that we have signed a lease for office and exhibit space at 159 High St. in downtown Belfast. The location was most recently home to the Bagel Café. The office, to be refurbished, will be in regular use by Nordic Aquafarms starting late this summer. 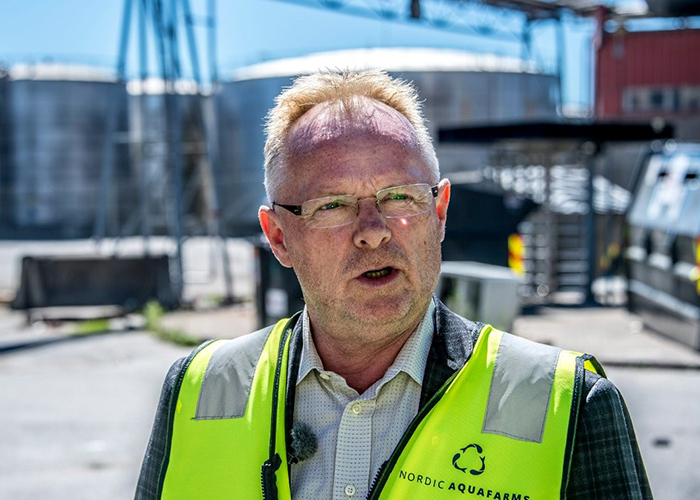 Members of the Nordic Aquafarms team will work from the office when they are in Belfast, and we’ll have information about the project on display when the office is completed. We’re excited to have a physical presence in the Belfast community while our project undergoes permitting and construction. Norwegian government underlines its support for our innovative fish-farming concept. Norway’s Fisheries Minister Per Sandberg was clearly impressed by the salmon facility in Fredrikstad during his visit on June 25th. A lot has happened since his last visit, and he took a full tour of the facility. Large investments have been made, and the first stage of construction will soon be complete. Minister Sandberg gave his full support to the land-based operation, noting that it will provide many jobs and promote technology development in Norway. Fredrikstad gives Norway a leadership role in land-based farming, Sandberg said to the news Channel NRK. He also made it clear that the authorities need to “push the button” on the remaining permits for Phase 2 development in Fredrikstad, according to the local newspaper, Fredrikstad Blad. Nordic Aquafarms has already received the construction permit and is ready to start construction later this year. During his visit, we showed Minister Sandberg the video of our planned Belfast facility. He also had the opportunity to meet with the first Nordic Aquafarms employee in the U.S., Carter Cyr, who has been visiting Norway, learning more about our company and its operations.